Have you just stumbled onto this site? It is not a coincidence! The Lord is providing you with divine information and wisdom from God's Word that you will need. Believe it! Preparing the way for the Lord, and making His paths straight! This podcast will amplify your understanding in this area, and in the process of these podcasts, we will see it even clearer. If you think the podcasts are too short, remember that the subject matter is rarely taught as we are presenting it. It will be new to many ears and we have to build this line upon line, precept upon precept, and can’t be in a hurry over it. Be mightily blessed through this anointed podcast! 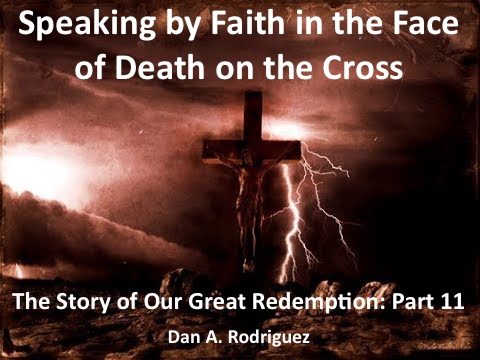 Download the free book that was the basis for most of this study, “The Story of our Great Redemption: Beyond Human Imagination!” That's the link to get the free 264-page book. I've published five different versions on this subject since 1977. The latest 2013 version in Spanish, “Tres Días y Tres Noches en el Corazón de la Tierra” is 290 pages long. That is the most complete version I have ever published. In its pages are many of the extra things I brought out in these podcasts that were not in previous versions. Get the free "Tres Días..." PDF here. Glory to God! Copyright 2019 Dan A. Rodriguez- Todos los derechos reservados. All rights reserved.